Find your perfect pair with the Kitchen Combination, featuring one of our favourite faucets matched with a best-selling sink. The Nola Pull-Down Faucet features an ergonomic dual-function sprayhead and top-quality components for maximum durability. The KGU-413b 31" Undermount Single Bowl Sink is made from 80% natural granite, for a look that reflects the natural beauty of stone. This combo comes with a matching soap dispenser. Experience Kraus Quality, and outfit your kitchen in style. Prestige Series Farmhouse Apron Undermount Stainless Steel 33 inch 50/50 Double Bowl Handmade Sink Built to last and endure, this sink is the relief your kitchen needed. 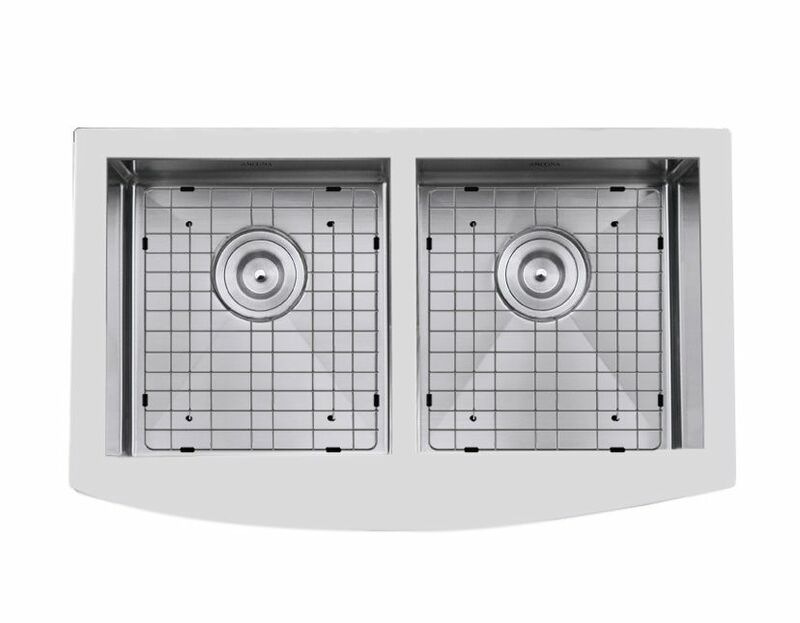 The Ancona Apron Double Bowl Sink is designed to be undermounted and will fit over most dishwashers and other cabinets. The delicate handmade craft displays its slender curves, which can integrate harmoniously with any set-up. Its intrinsic design allows two ample bowls, concealed by a stunning front apron facade. The Ancona sink delivers quality long-lasting sink guaranteed to improve your everyday kitchen affairs. Prestige Series Farmhouse Apron Undermount Stainless Steel 33 inch 50/50 Double Bowl Handmade Sink is rated 4.7 out of 5 by 15. Rated 4 out of 5 by brisun from Attractive double sink We purchased the sink about two months ago. It is a deeper sink however it works well with the grates and the baskets in the drain. We are pleased with the look and would recommend this sink. Goes very well with the granite counter. Rated 5 out of 5 by Berta from Perfect Size I love the deep single sink I can now wash my large pots & trays without making a water mess on the counter. Rated 5 out of 5 by 6thKitchenReno from Beautiful, durable and easy to clean I purchased this sink through Costco after spending a lot of time searching online and in specialized stores for the sink that had all the characteristics I wanted. Our family of four has been using it for 5 months and I can testify it has exceeded all my expectations so far. The sink is well insulated for noise, will not bend due to hot water. It is very easy to clean due to the rounded corners. All my friends are jealous of those basket strainers, which really are as useful as I envisioned. The grids are well-made, very stable and do not get clogged with food residue. I love the way the sink is split, since it provides all the benefits of a single basin, while providing access to the second drain when cleaning dishes or using the smaller section to leave dishes to dry out of sight. The small section is large enough to leave a colander in or clean some dishes. The size and depth of the sink are very convenient. It fits very well in my 36 inch cabinet and our quartz countertop providers had no issues installing it. The only elements that I would've liked to know before the installation are the following. - The combined depth of the sink, deep basked strainers and plumbing will use most of the space in the cabinet, leaving only about 12-18 inches under the sink for storage. - We debated the placement of the faucet. Since the sink is under a window, we chose to put it in the center. However, the faucet we picked (Aquabrass Spaghetti) is a bit small to comfortably clean dishes in the small section without holding the pull-out nozzle. Check your dimensions or consider installing the faucet in line with the division if this is something you might want to do. Overall, we are very satisfied and, for the price, it really is unbeatable, since the other sinks we had considered were more than twice as expensive. Rated 5 out of 5 by KQBQ from Great sink. I bought this for the second sink in my kitchen area. I also a have large single sink. This would be fine as the only sink in a kitchen. It is not wide but very deep so there isn't much that it doesn't fit. I love the grids in the bottom and using the second sink to air dry without items visible on the counter. Rated 4 out of 5 by nguay7 from Good quality I bought it for my new (renovated) kitchen and I am happy with it.